New Year on Newbury Street - The Junior League of Boston, Inc. 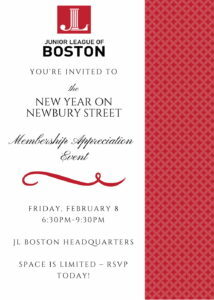 Membership Council invites you to celebrate the New Year on Newbury Street! Please join us at our beautiful Newbury Street headquarters to kick off the new year with an evening celebration of friends and fun! This is the biggest membership appreciation event of the year and is open to all members, prospective members, and significant others/spouses! Light bites, refreshments, and games will be provided. This is a great opportunity to mix and mingle with all members as well as JL Boston leadership! JL Boston members will earn a full point for attending this membership social event! Don’t miss out! Friday, February 8 – 6:30pm-9:30pm – JL Boston Headquarters – Space is limited – RSVP today! There is no cost for JL Boston members or their guests to attend this event! Prospective members will be asked to contribute a $10 donation. *Please note: All guests must be 21 years or older to attend. Non-JL Boston members will be asked for identification upon arrival. Support One of Our Community Partners! We’ll be hosting a drive to benefit the Jeremiah Program. Please help us support them by bringing feminine hygiene products to this event.